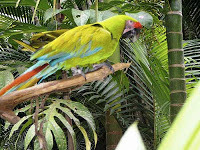 Join us in the jungles of Costa Rica to work fauvist portraiture magic on local flora and fauna. 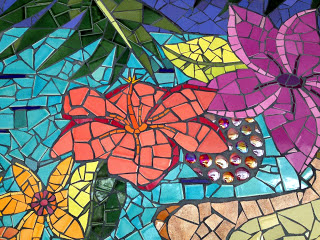 Whether you’re drawn to the lush foliage and floral exotics of the rainforest or the brilliance of toucans, macaws, the Blue Morpho butterfly, or beady-eyed tree frogs, we’ll spend a week creating mosaic “portraits” of Costa Rican beauties. We’ll explore forest paths, gardens, and sanctuaries on our first day, allowing ample time to capture the photographic images that make your heart go pittypat. We’ll then work to simply images for mosaic via photo editing and collage techniques. The rest of the week will be yours to work with the group or alone, with optional daily instruction, demos, and personal attention. 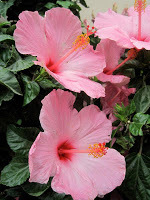 We’ll also schedule a free day for adventure activities, as well as one or two shorter excursions. 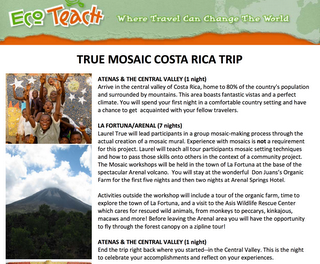 At the top of the list will be a visit to nearby Arenal Volcano, as well as a good soak in the local hot springs. Accommodations will be at Finca Luna Nueva Lodge, an eco-lodge and organic farm situated in a private rainforest preserve adjacent to the Children’s Eternal Rainforest. The lodge includes 7 rooms with bath and wrap-around porches, plus individual or family garden cabinas, pool, jacuzzi, and spa with a wide range of treatments available. Daily organic meals prepared onsite by a Slow Food Movement chef will be included. Special Request meals can be accommodated. All rooms are single accommodations with one queen bed. A very limited number of double accommodations may be available. Please contact for pricing if a spouse wishes to join you. $1,960 price includes arrival and return shuttle for our group from San Jose Airport to Finca Luna Nueva (New Moon Farm), accommodations for seven nights (Saturday – Saturday), seven breakfasts, five lunches, and five dinners, one guided farm tour, one guided rainforest tour, six days of instruction including one-on-one time, and Welcome Reception. Students will be responsible for bringing materials, tools, and substrates. 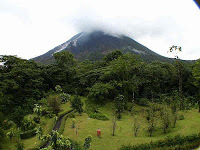 Optional activities at an extra cost include guided Arenal Volcano Lava Hike, two lunches and dinners in town, Butterfly Garden or Cloud Forest Tours, Zipline Canopy Tour, Rafting, or Hanging Bridge Canopy Tour. One day will be set aside for On Your Own Adventures. Airfare, local transportation (excluding airport shuttle), optional tours, alcohol and gratuities are not included in the trip cost. Class is limited to 12 participants. Room selections will be made in order of full payments received. Average high in November is 82; average low is 68. For a tentative daily schedule or more information, please email Pam. For more information about Carol Shelkin, please visit Carol’s website, or Carol’s class description. For more information about Pam Goode, please visit Pam’s website or business page. To register, please email Pam with name and contact info. Deposit of $500 (1/2) may be made through PayPal or by check. Payment in full must be completed by October 1, 2013. All cancellations are subject to a 20% handling fee. For reservations cancelled 90 days or more before workshop, 50% is refundable. If cancelled less than 60 days before the workshop, 25% is refundable. If cancelled less than 45 days before the workshop, fee is non-refundable. Should any workshop/retreat be canceled the entire amount paid will be refunded within fourteen days after the tour’s cancellation. Instructors have no obligation regarding any additional costs or fees related to the issuance and/or cancellation of airline tickets or other travel reservations. Instructors and Finca Luna Nueva Lodge accept no liability for any airline cancellation penalty incurred by the purchase of a non-refundable ticket or for canceled flights.